Maybe the best way to see 80 kilograms at the 2017 US Greco-Roman World Team Trials is that of a sports franchise. Don’t look at the athletes here as each other’s competition but instead, for just a moment, perceive the entire bracket as a team of players. Most successful pro sports teams have a presence of hardened veterans, guys who’ve been around the block a time or two and “know how to win.” On the flipside, a gaggle of young, hungry talents are also called upon to rise to the occasion in the midst of crucial circumstances. This may be an individual sport, its “players” are meant to defeat one another. But in the ebbs and flows of a weight class’ development, there is a mutually beneficial relationship between the rise of some and the continuity of others. Despite credentials that pop off the page, Geordan Speiller (Florida Jets, world no. 9) could be considered part of the youthful influx that has US Greco-Roman fans excited for the future. Originally set as a 75 kilogram competitor, Speiller entered into 2017 up a weight following a pronounced layoff. You all likely know the drill by now. The 23-year-old’s first tournament back, the 2017 Dave Schultz Memorial, resulted in both a tournament win and a victory over Rio Olympian Mahmoud Sebie (EGY). It’s not that Sebie represents Speiller’s most impressive scalp, it’s the fact that it was Speiller’s first time back in over seven months and had to gut it out (no pun) in order to prevail. For all of his previous successes or signature wins, the defeat of Sebie was eye-opening because it showed his time away did not disrupt what is perhaps one of the most striking trajectories of any athlete in the country. If Speiller is the flash, Cheney Haight (NYAC) is the substance. Haight, 32, remains a steady, potent force during what is in its own way, a rebuilding phase for the program at large. He’s durable and reliable. The stuff Haight is made out of should be analyzed and preserved for future generations. You’ve heard the stories for years — No one works harder; he is always ready for more; Haight never breaks. They’re all true, of course. There certainly isn’t another wrestler here who competes harder, though Jon Anderson (Army/WCAP) could also stake claim to that title. The funny part is, these are the two oldest wrestlers in the bracket we’re talking about and the first thing that comes up is work-rate. Then there are, in no particular order, Barrett Stanghill (Minnesota Storm), John Stefanowicz (Marines), and Jon Jay Chavez (NYAC). Stanghill, the former Northern Michigan student who is now a full-time Senior, has begun to demonstrate notable leaps in his game since coming on with the Storm and has already garnered a few impressive match wins over the last several months. He has two modes, but needs that second one switched on more often because when Stanghill is wrestling confident, i.e., knows he can score, he is ferocious. Stefanowicz might trend young, and he is, but of the three here, possesses the most consistency. He is also fearless. Like absolutely-positively fearless. Whether or not you lament forced par terre’s absence, its exclusion has given Stefanowicz the licensure to pound and pound with inside pressure, and claw at tie-ups that usually provide him with scoring chances. And he actually takes those chances, bless his heart. Chavez, the kid from Cornell, the age-group stud, cannot be taken lightly. All that is missing is some refinement, some tweaks, and maybe a little more time hardening up with the Seniors. Chavez moves so easily on the mat. Very rarely is there wasted motion or hesitation. Greco forces him to stay upright — a necessity. Once Chavez realizes that he can use his balance and positioning to take command of tie-ups and avoid mistakes, like leaving openings or not digging back in, he’ll take another jump up. Removing any and all pretense, Speiller is the best wrestler in this weight class. It’s not subjectivity and if you would even like to remove his surge up the UWW rankings thanks to his performance in Hungary last month, just with a pair of somewhat-working eyeballs, anyone would be able to tell what he is currently capable of. No athlete at 80 in this country or maybe even on the planet is faster or more dynamic. Plus, Speiller does all of the things Greco coaches want out of former folkstyle athletes — he changes levels, he explodes his hips in, and he constantly attacks. He has also defeated most of the top guys here, including Haight and Stanghill. Surely, they’re aware. Make no mistake about it, Speiller’s back is where the target for everyone else resides. Aside from his gold at Schultz, Speiller most recently also won the Havana Cup in Cuba, a pleasant one-match tournament victory (and apparently an exciting one). Next was the aforementioned Hungarian Grand Prix, where Speiller defeated three extremely tough opponents en-route to a finals clash with 2014 World Champion Peter Bacsi (HUN, world no. 2). Speiller defeated Bacsi at the 2016 Grand Prix, but fell this time around 4-0 on a single arm throw. He torqued his arm a little in a previous bout but by all accounts, is completely fine as of this writing. Haight has had an active campaign 2016-17 campaign thus far. First it was the inaugural Non-Olympic World Team Trials in November, where a semifinal criteria loss to Anderson spoiled his bid for a second World Team. Next, it was onto Azerbaijan for the Golden Grand Prix. Wrestling at 85 kilograms, Haight was eliminated in his first bout. But he had better luck at the World Wrestling Clubs Cup in Budapest, going 2-3 with one of those losses being a close 3-1 decision to two-time Olympian and 2015 World Champion Selcuk Cebi (TUR). The Utah native was back at it again just a couple weeks later. The 2016 US Open provided Haight with his second National title (over six years between his first and his second — there is something to be said for that). A month and a half later came the Schultz and a busy 9-6 decision over Stefanowicz in the quarterfinal. Haight dropped the proceeding two bouts, however. At the Thor Masters Invitational in Denmark, Haight won his first match against Hannes Wagner (GER) before falling short in two close losses later on. On the last stop of the March European Tour in Croatia, Haight wrestled well and advanced to the bronze medal bout, coming up just short of a medal. Haight has lost fairly decisively to Speiller in their two meetings, the second of which a 7-0 blanking for Speiller in last year’s Trials challenge tournament final. But outside of losses to Anderson and Stanghill at the NYAC in November, Haight has been performing well against domestic opponents and at this stage in his career, should still be looked at as one of the very few wrestlers at 80 capable of giving Speiller a run for his money. The last time we saw, really saw Jon Anderson, he was bulldogging it up against Patrick Martinez (85 kg, NYAC) in November’s World Team Trials at the Bill Farrell Memorial/NYAC Open. In that best-of-three, it was the best of Anderson — nonstop movement, grit for days, and enough pressure to throw off the NYC power grid. It wasn’t enough, Martinez emerged two victories to one, but any ideas Anderson is starting to hit the back nine of his career were definitively squashed. He’s up there in age along with Haight, but guys like them are built to last. Naturally, you’d think that Anderson would have been right there in lockstep with Haight at the US Nationals a month later in Vegas, but that was not the case. Anderson’s pressure-happy approach was sidestepped in favor of a more patient gameplan, something that did not mesh well with his style. It made Anderson a little too tentative, which was easy to see in his semifinal loss to Chavez. Stanghill got in on the action, too, turning back Anderson for third place on the heels of a 3-0 decision. Following the US Nationals, Anderson went on temporary duty/schooling for his military career (he’s now a Major) and pieced together training while in Virginia before returning to WCAP in Colorado Springs. Anderson, admittedly, does not offer up the same kind of technical prowess guys like Speiller, Haight and others have going, but so what? At the end of the day, this is a fight sport and no one fights like Anderson. No one. If he rediscovers the relentless go-forward methodology that helped him win the Pan Ams and become a perennial contender, he could wind up in position to finally make his first team. These two are linked because for one thing, they’re both young and on the cusp of being consistent elite competitors. Also, they cannot get out of each other’s way. Chavez and Stanghill have met up multiple times over the years dating back to when they were age-group athletes, with Chavez holding the edge in victories, although Stanghill one-up’s him in other departments. As a Senior, Stanghill might be the more dangerous of the two right now even if head-to-head results beg otherwise. Stanghill is almost always in good position. It’s also not an everyday thing for Stanghill to neglect meaningful tie-ups and shoo away openings. He’s also plenty powerful enough once he gets going to move opponents around the mat and pick up step-out points. Stanghill placed third place at the Nationals. In fact, he got his the hard way, losing to Chavez in his first bout ahead of running the table in the consolation bracket. At the Schultz, a 4-2 quarterfinal loss to Egyptian Olympian Sebie gave way to a surprisingly one-sided defeat at the hands of Stefanowicz. Next, Stanghill flew overseas to Hungary for training camp and the Hungarian Grand Prix. In his lone match of the day, Stanghill was ousted by Pavel Pominchuk (BLR), which is the last time he has competed. For his part, Chavez hasn’t been in a match since the Open final against Haight. Could it be that Stefanowicz is close to delivering a reckoning to everyone here? It’s not unthinkable. Stefanowicz has either beaten or competed well against most here. He qualified at the Open by virtue of finishing fifth, brushing past Junior Tommy Brackett (WTTC) to do so. He took losses to Haight and Anderson before that, one a tech, one a 6-3 nod the other way. Stefanowicz pressed Haight much more at Schultz, as mentioned above. Stefanowicz nearly had full control of that bout before Haight took over late. A few weeks later, the Armed Forces Championships called and Stefanowicz was back down at 75, where he went 2-1, the one hiccup an entertaining dust up with Dillon Cowan (Army/WCAP). There is no doubt Stefanowicz’s coming of age moment arrived in Hungary. After being tech’ed out by Bacsi, Stefanowicz won his repechage bout versus Nicu Ojog (ROU) because he kept his foot on the gas. While there weren’t any offensive points scored, the two passivity knocks that went Stefanowicz’s way were well-earned. But what happened next is what truly made an impression. For third place, Stefanowicz went against 2016 European Championships gold medalist and Rio Olympian Zurabi Datunashvili (GEO, world no. 3) and very nearly pulled it out. The way the match unfolded, you wouldn’t have even been able to call it an upset — Stefanowicz might have been outgunned some in technique, but he was all over his foe. It was almost a breaking. Down by two with seconds left, Stefanowicz went in for an arm throw, thought better of it, spun around, and then got Datunashvili to the edge and appeared to toss him for four points. It wasn’t called that way, Stefanowicz was only awarded two and lost via criteria. When a guy who has been consistently improving as a Senior and then seems to have realized something about himself overseas, it’s easy to overreact. But if the Stefanowicz who showed up in Hungary is the same one who will be pulling the straps up in Vegas, everyone in this bracket would do well to look out. Courtney Myers (Army/WCAP) Myers deserves more love being a previous finalist. He isn’t being talked about the same way as the others simply because either the results haven’t been there or injury, take your pick. 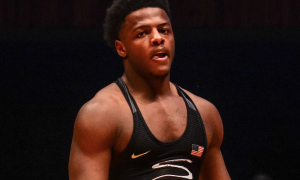 You want, you need a healthy Myers at the World Team Trials. He is a bomb-thrower when he is on his game and scary tough to exchange with. He’s a guy no one feels comfortable tying up with because he finds ways to chip and beat you up inside and then as soon as you feel like there is a moment to breathe…bam! Myers had a fracture in his chest through most of 2016 and it cost him. He was an able-body at the Armed Forces in February and wrestled like it, racking up three technical superiority wins, including one over Marine Michael Brant. That’s the Myers people want to see and hopefully he’s ready to get after it. Sergio Guerrero (NMU-OTS) Still a project, Guerrero is not expected to do too much here. That’s okay. Guerrero is one of the Northern wrestlers who is just starting to carve out a niche on this level and for all intents and purposes, this is the right weight for that to happen in. There is some rawness here, but what you like about Guerrero is that he doesn’t wrestle with hesitation. He also isn’t seasoned enough to try to game everyone with pretentious rest holds for passivity points. In Vegas, Guerrero brought the heat on occasion, locking up for throws and coming close with others. That sort of approach is exactly what he should bring with him to the desert. 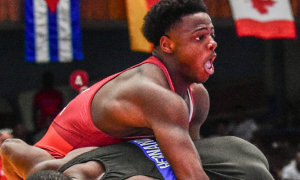 Brandon Johnson (Air Force) Once an 85’er, Johnson punched his ticket for this year’s World Team Trials at 80 and it seems to have been the right decision. He’s another Armed Forces athlete, so you don’t get to see him too much. Assuming he is attending, Johnson will be playing the role of potential spoiler. 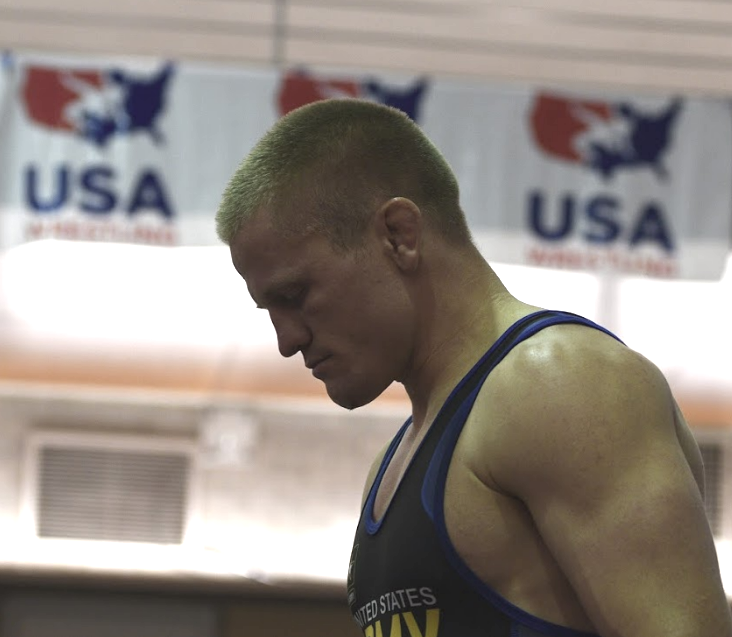 In limited action over the last couple of years, you could see that if not selflessly devoted to serving his country, would probably blossom into a very legitimate full-time Greco-Roman competitor. That isn’t the case yet. For now, look for him to bring a brisk pace — it’s how he moves. Johnson is quick and is very adept at chaining things together, he’s got a sense for where he needs to be.